My job takes me mostly to cities, but wherever I am, I want a sense of the natural landscape. 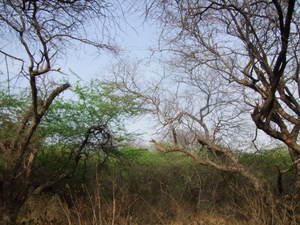 In Delhi without a car, that meant a quick hike on the Delhi ridge, an extension of the Aravalli range that defines the western edge of the city. Reading these posts on India I find myself wondering: what does it all sound like? Out in the streets, at night, at noon, in the large stone buildings, inside the police station, for example. The mad surge forward you speak of must have attendant noise of some kind. And I find myself entertaining various sounds in my mind. While in Delhi I had occasion to visit two police stations. (Don't ask, but I wasn't a suspect.) Both were cavernous concrete buildings with almost no decoration inside or out, but every office contained at least one chipper poster on "Lane Discipline". The message was something like "Stay in your lane! It's safer! It's fun! And it's the law!" I'm glad the police are getting this message, because I certainly didn't see such a poster anywhere else. 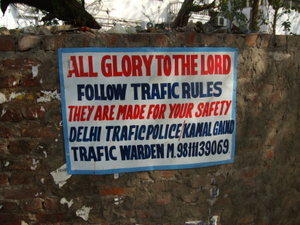 In fact, the sign above is the only hint I ever saw of traffic law enforcement. (Question for India experts out there: Will the words "All Glory to the Lord" sound equally appealing to Hindus as to Muslims?) The police seem, in general, to have a remarkably calm and realistic air about how much they can affect life in the city. Key principle of life in India: Nobody is in control. Certainly not the police or anyone else in the government. India -- especially the new industrial India -- is a vast surging natural force. The only way to seem in control of it is to run a little ahead of it in the direction it's already flowing. The government does this on a good day, but even that is hard to do for long.